Kit grew up riding, loving, and living with horses since before she could walk, but it was much later in life that she learned the deeper wisdom that horses hold. Partnering with horses, Kit helps us connect with our own inner wisdom leading to authentic relationships with ourselves and others. She excels at creating a safe space to observe ourselves and our patterns to identify those that are serving us and those which are not. Kit holds Master’s Degrees in Education and Counseling. A former trainer and business coach for a Fortune 500 company, she continues to teach for Webster University. 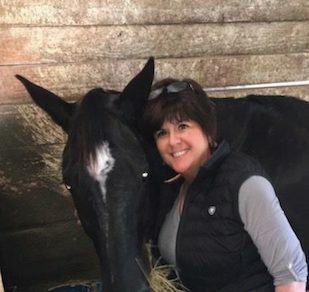 In addition to being an Equus Coach and Certified Master Facilitator, Kit has completed Martha Beck Life Coach training and is a member of the International Coaching Federation (ICF). Kit coaches individuals, couples, professionals and teams in private sessions or workshops.